Summary: A would-be world conqueror named Karvac summons an elder god once worshipped by the Phoenicians, Scorio, who takes the form of an alligator. Scorio gives Karvac the knowledge of a flame-weapon which will melt the flesh of anyone hit with it. Karvac and his men then use the weapons to attack an Army regiment on manuvers, wiping them out almost to the man. The lone survivor manages to find a motorist -- Shiera Saunders, who lets Carter Hall know about the attack. Hawkman, armed with a mace and a net of "Ninth Metal," confronts Karvac's men. With the net able to resist the fiery attack, Hawkman takes out some of the goons, and takes one of their guns to confront Scorio. The weapon does not kill Scorio, but does banish the elder god back to his own dimension. Hawkman then has the soldier and Shiera call in an air strike from the Army, which wipes out Karvac's forces. Karvac, seeing the writing on the wall, tries to kill himself by jumping off a cliff, but Hawkman captures him and turns him over to the authorities. Review: One of my favorite of the Golden Age stories so far, this one has a little bit of everything, from the B-movie Western setting to an elder god to a weapon which vaporizes any shot with it to the cavalry coming to save the day. Bonus points for Hawkman using his now-trademark mace to bash some of Karvac's men. Sadly, neither Karvac nor Scorio would make any further appearances. Shiera has a good showing this time out, although I should note that a caption box says that she is the only one who knows Hawkman's secret identity -- knowledge she seemingly gained off-panel sometime either in this issue or the previous. Also interesting is a weapon actually made of what is still called "Ninth Metal," (now, of course called Nth Metal) which was a first for the strip at this time. Image: Flash Comics #14, 1941, Sheldon Moldoff. Today's artifact ties in with the Super Powers theme from earlier in the week, as we have a set of "Puffy Stickers" featuring the various heroes of the SPC. Hawkman gets double duty here, as both a sticker and on the cover of the included album. Very cool to see Sparring Partner/Frenemy/Rival/Goateed Moron Green Arrow making the cut as well as Aquaman, although the lack of Martian Manhunter is disappointing. Notice also how much more prominent Batman and his ilk are compared to Big Blue. Anyhow, this neat little piece of nostalgic history comes from Honor Wings Bearer rob!, curator of The Aquaman Shrine, and all-around blogger extra-ordinaire. Thanks a ton, rob! 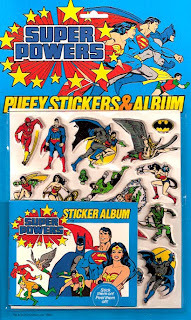 Image: Super Powers Collection Puffy Stickers and Album, 1984, retrieved from The Aquaman Shrine. Can we expect any new goodies with the Winged Wonders this week at our local comic shops? Let's check it out. Green Lantern #45 -- Black Lantern Hawkman and Hawkgirl perhaps? I am not picking up any of the BN tie-ins at this point, although the issue with Flash and Green Lantern battling the Martian Manhunter was pretty cool. Trinity v.2 TPB -- Hawkman appeared regularly in the backups of this maxi-series, so he should pop up a few times in this volume. At some point I will order the whole set of these and then just let them taunt me from my reading shelf. Wednesday Comics #8 -- Dinosaur Island?! Of all the islands in all the oceans, why did it have to be Dinosaur Island?! I've written before about my memories of the Super Powers Collection from my misguided youth. Well, the 25th Anniversary of the SPC is upon us, so it's high time we take a look at two of Hawkman's starring turns from the mini-comics which were included in the first few waves of the toyline! 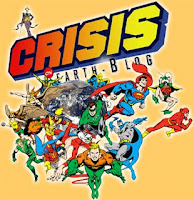 That's right, it's another Crisis on Earth-Blog crossover! Summary: In Midway City, Carter Hall's evening is disturbed by a flock of crazed birds crashing through the window of his office. Quickly changing to his heroic identity of Hawkman, he investigates, finding his winged friends stealing pricess artifacts. Hawkman quickly spots the problem in the form of Lex Luthor's Lex-Soar 7 ship. The Winged Wonder swoops in to attack, but Lex zaps his wing harness with a laser. Falling, Hawkman is saved by the sudden appearance of Green Lantern and the Flash. While GL repairs Hawkman's wings, the Flash is trapped in an energy net from the Lex-Soar 7. Lex then sends a flock of crazed birds at Hawkman and Lantern, but GL quickly whips up hundreds of emerald bird cages to hold them. Hawkman then uses his wings to create a great burst of wind, which crashes the Lex-Soar 7 into a lake. Green Lantern hauls the ship out of the drink, Luthor is arrested, the artifacts recovered, and the birds revealed to be robots. Review: Well, if you were a little kid who just got a Hawkman toy as a gift and had no idea who he was, this is a pretty decent primer. Sure, it leaves out the whole alien thing, and Hawkgirl is nowhere to be found, but for this basic adventure I can't complain too loudly. The art is simplistic but effective, and the script is basic enough for a child to follow easily enough. There's some nice co-sells for the other characters and the Lex-Soar 7, which is always nice, heh. Also nice is that Hawkman uses his action feature (flapping wings) to defeat Lex Luthor. Coincidence? Yeah I think not! I wonder how many kids read this comic and then became Hawkfans? 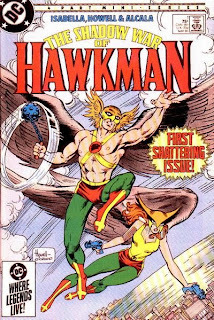 Image: Super Powers Collection #12: Hawkman, 1983, ???. Summary: Bruce Wayne is hosting a charity ball, a guest of which is the "illustrious" Carter Hall. Things take a turn for the worse when the Penguin and his gang of highly trained birds attack the party and rob all the patrons! Bruce and Carter leap into action, changing into Batman and Hawkman. While the Winged Wonder calms Penguin's fiesty flock, Batman hits the Batmobile and gives chase. As Penguin and his goons gloat, Hawkman catches up to them and captures the gang in a net. Thinking he is now home free, Penguin is surprised by Batman, who uses the ejector seat in the Batmobile to launch himself up and grab the Bad Bird. With Penguin and his gang in the hands of the police, the heroes head on back to the party. Review: What a classic set-up: a charity ball attended by the hero(es) gets robbed by the bad guy and they have to give chase? That's "Old School" my friends! A fun little showcase for all three characters, as each gets a chance to shine. Hawkman showcases not only his *wheet wheet* powers, but also breaks out an ancient weapon in the form of a net, which was a treat. But Penguin and Batman are the real stars here, unsurprisingly, and this depiction of Penguin as someone who would use a helicopter umbrella to rob a penthouse is charming and delightful. I also like the co-sell for the Batmobile, as well as the clever way of avoiding having to mention Robin (what would a kid be doing at a stuffy old ball, anyway?). I can really see this as a springboard story for kids to invent their own capers with their new Penguin action figure. Image: Super Powers Collection #6: The Penguin, 1983, ???. Notes: Hawkman also appears in the mini-comics for The Flash, Robin, and Red Tornado. Also, check out my thoughts about the Super Powers Hawkman toy, one of the earliest posts I ever made here on Being Carter Hall. What would a crossover be without, well, crossovers? Be sure to go and check out these other fine superhero blogs and sites and explore the 25th Anniversary of the Super Powers Collection in more depth and detail than you ever thought possible! What a collection of super-talent! Special thanks to shag of Firestorm Fan and Once Upon A Geek for putting this crossover together! Blogs Will Live! Blogs Will Die! Crisis on Earth-Blog! While running errands on Saturday (and I'll be honest, since our son was born, weekends seem like one big errand), my wife and I ended up at Ross. Being the comic nerd that I am, I knew to run back and check the toy department for deep-discounted action figures, and I was rewarded: DC Infinite Heroes 3-packs for $4.99! Woo! 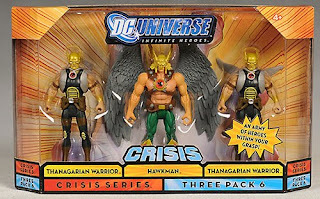 A little searching yielding my prize, the Hawkman and Wingmen (or "Thanagarian Warrior") set. Upon opening (and yes, I decided to open these guys rather than the Showcase Presents Hawkman or DCUC Hawkman I still have sitting upstairs), one of the first things I noticed about these guys is that they have really big hands. All three of them have these big skillet-like fists, which look like they are designed to snugly hold accessories. Which is great, except for the fact that they don't have any accessories! Doh! At the 3-3/4" size, accessories are a must, and this is a big disappointment to me. The two Wingmen are pretty good sculpts as well. They somewhat resemble the Wingmen we saw in Rann-Thanagar Holy War, but are different enough to be something of an original design. I managed to find one where the wings, made of soft plastic, were not bent, but be careful to look for that if you see these in the stoes. Coloring wise they look appropriately Thanagarian, although the brown and gold bands painted onto their bare arms look a little cheesy. Unfortunately, they are more prone to Fall Over than Hawkman since they do not share his stance nor shoe-size. Still, for an Army Builder style toy I can't complain -- for this price I would have bought just Hawkman so these guys are like gravy. Overall, I'm a bummed about the lack of accessories. Now I need to start hunting cheap toys to find a mace for Hawkman and some sci-fi blasters for the Wingmen. But otherwise, especially for five bucks, this is a very cool set worth picking up. I don't know if I would have been as happy with them if I had paid full price, but at the discounted rate you can't go wrong. I am a fan of the scale and hopefully we will continue to see more of this size toy from DC in the future. Going to shift gears a little bit and feature the Golden Age Hawkman here on Sketch Day. 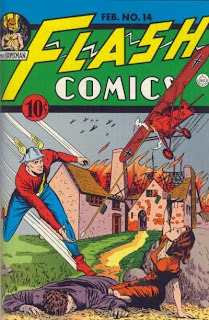 And that's not all: we also get the Golden Age Flash as well. And even that's not all! It's also by Sheldon Moldoff! This is illustration pretty much sums up the basis for my enthusiasm for Moldoff's work. Between the inky mass of the wing harness, the trim musculature (complete with the feathering inks), the classic helmet, and the nasty looking mace, this is one tough hombre! Add to that the bright, cheery, almost sprite-like Flash and you have a recipe for a great black and white piece which I wish I could afford to own! A lot of times, Golden Age artists don't hold up to modern eyes, but Moldoff is definitely not one of those artists. Overall just a great piece! 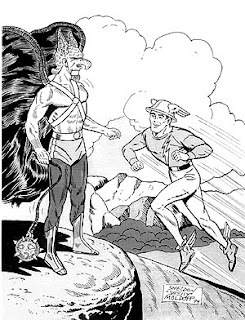 Image: Hawkman and Flash sketch, 1994, Sheldon Moldoff, retrieved from TwoMorrows. An interesting panel from Justice League: Cry For Justice #2, where Green Lantern talks about how he never got along with Batman. This is of interest primarily for Green Arrow's comment about how they supposedly got along worse than he and Hawkman, which I find hard to swallow. But Hawkman is not in this miniseries and Green Lantern is, so I guess that's how it rolls. What do you folks think? Are Carter and Ollie still the classic bickering teammates of the Justice League? Or does this new-fangled idea of Green Lantern and Batman overtake them? You make the call! Image: Panel from Justice League: Cry For Justice #2, 2009, Mauro Cascioli. Any neat Hawk-stuff showing up today at your local comic shop? Let's take a look! Wednesday Comics #7 -- Things took a drastic turn last week, as the strip shifts from a skyjacking to something different entirely. I know we are closing in on an Aquaman appearance, which is funny since he popped up over in the Supergirl strip last week (on a clam cellphone, no less). I could see Hawkman and Aquaman getting along alright, better than most other members of the Justice League whom I imagine Katar would rub the wrong way. Plus the whole "talk to animals" thing, too. Title: "The Shadow War of Hawkman"
Summary: Small-time hood Mousey Mason returns to his tiny apartment to find himself surrounded by strange beings who "bleed in" from shadows. They task him with retrieving certain items from the house of former Midway City Police Commissioner Emmett, now home to museum curators Carter and Shiera Hall -- namely, their anti-gravity flight devices! Meanwhile, Hawkman and Hawkwoman are beating up some thugs, and get the chance to run into new Deputy Police Commissioner Frasier. The fight causes Katar thoughts to become mazed, thinking about how his father invented the flying harness, how he met his wife and partner, and how they travelled to Earth and became superheroes. His thoughts then turn to the Equalizing Plague on Thanagar, and how the tyrant Hyathis usurped control of the planet. But these thoughts are put on hold as the couple returns to the museum, and has to finish several exhibits opening in the morning, and have to deal with Mavis Trent and press secretary Joe Tracy. But their work is soon interrupted by an alarm indicating trouble at their home. Katar wings off to investigate while Shayera stays behind to work. He is disturbed to find that the local birds are so scared they can't tell him about the break-in, but the Winged Wonder soon discovers Mousey inside, nosing around for the flight harnesses. Mousey quickly gives up the whole story, and Hawkman is shortly thereafter ambushed by five of the shadow-hopping foes. Hawkman is able to hold his own despite being outnumbered, but when Mousey attacks one of them, he is vaporized, leaving only a white silhouette against the wall. The enemies beat a hasty retreat, flooring Katar with a sonic bomb. Hawkman rushes back to the museum, but he is horrified to realize that he is too late, finding a walled silhouette in the new exhibit of Hawkwoman, and no other trace of her. Review: "The first battle in the invasion of Earth will be fought in the shadows." With that sentence, a new era of Hawkman comics began. And what a beginning it is -- with a cliffhanger like that, it was clear that Tony Isabella and Richard Howell were not interested in "business as usual" Hawkman comics. This story builds upon everything which has come before, but essentially settles all of them before driving the proverbial dagger right in the ribs of our heroes. This is a very strong debut issue both for the storyline (which would continue through this series and into Hawkman's second eponymous title) as well as the creative team, who both shine. Isabella has an interesting voice for Hawkman, playing on the fact that he is an old man by Earth chronology. But he never loses the character or his classic traits (I used "mazed" up there as a verb on purpose, hint hint). Howell has a sort of Murphy Anderson look, but not really; I say that because his Hawks are trim and athletic like Anderson's rather than bulky or feathery. He is a good fit for the shadow-drenched visuals in this comic, and he handles the human characters well also, including giving Mavis Trent a look straight out of Modern Rhymes-With-Witch Magazine. Overall, fans looking to get their hands on some classic Hawkman outside of the boundaries of the Silver Age would be extremely well-served in picking up this issue and going from there. Very strong across the board. Image: Shadow War of Hawkman #1, 1985, Richard Howell. I saw these Super Deformed LRG (Little Rubber Guys) at Toys R Us a couple of weeks back, and was instantly delighted with them. The main TB&TB toyline is nifty, but this subline is downright adorable! They really capture the dynamic charm of the cartoon series while still inject a little SD fun for those of us who enjoy that sort of thing. 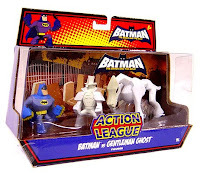 The Gentleman Ghost figure looks great, using the same "molded collar to hold up his tophat" trick that is being used on his JLU toy. He doesn't have a lot of color, but it's the Gentleman Ghost! It's hard to see in this picture, but he is pretty detailed for an LRG. There is also a mostly transparent variant which is sold in a 6-pack. His spectral steed is a nice accessory -- I wonder if he can actually mount it? Also, notice what the Dark Knight is armed with: Nth Metal Knuckles! Wooo! Now, let's quit beating around the bush and get Hawkman on the show and in the toylines! Kyle Baker, who of course is handling the Hawkman strip in Wednesday Comics, has been interviewed over at Comic Book Resources as part of their ongoing series of talking with the creators on the project. You can check out the rest of the interview here. Baker doesn't sound like he was a Hawkfan before working on the project, but instead chose Hawkman mostly for what he could do with it, as suggested in the above exchange. Still, some good insight into how the strip is produced and what we can expect from Baker in the future. Is there any new swag coming to your local comic book shop this week featuring our favorite feathered heroes? Let's take a look. Blackest Night #2 -- Geoff Johns epic continues, picking up (hopefully) on where the debut issue left off with the murder and subsequent resurrection of Hawkman and Hawkgirl. I'm on board for this series and hope that the second and following installments can live up to the extremely strong first issue. That, and that somehow after all the dust has settled that the future of Hawkman and Hawkgirl will be clear. Well, at least, clearer. Wednesday Comics #6 -- Got the chance to read Wednesday Comics #4 and the Hawkman strip from #5 last night, and at this point I am comfortable admitting that my initial impression of Kyle Baker's work on the character was wrong. I still don't like how he handles the art on the helmet, but at this point that is nitpicking. The cameos last week from Hawkgirl and Batman were great, as was the outerspace battle between the alien fleet and the Hawks' ship, with an assisst from the JLA Satellite. Where this is heading is anyone's guess but this is the kind of fun, action-oriented stories of which we need more these days. Any Hawkman or Hawkgirl related goodies this week at your local comic book shops? Let's have a look! Justice League: Cry For Justice #2 -- Both of our Winged Wonders popped up for cameos in the first issue, so they might make token appearances here. The first issue was not bad, but finances are forcing me to put this one on hold for the time being. Wednesday Comics #5 -- I have not had a chance to pick up #4 yet, so I am a week behind on my Hawkman strip, but after the installment in #3 I have confidence that Baker has the right approach, even if I personally don't like parts of his artisitc style. I think that is an important aspect of criticism -- recognizing the good and the bad of something, an approach I try to take when looking at not only comics but film, books, and so forth. Super-fun webcomic Let's Be Friends Again (which if you are not reading, I heartily suggest you start!) ran this amusing little comic last week. As both a Hawkfan and a Republican, this made me laugh so hard that it warmed the cockles of my cold, shriveled, dead heart. The smug look on Hawkman's face in the second panel totally sells this one! Great work, guys! Image: Let's Be Friends Again strip "Superman = Super Muslim? ", Let's Be Friends Again, 2009, Curt Franklin and Chris Haley.